The ellipse, the parabola, and the hyperbola are collectively known as conic sections, because these three types of curve can be obtained by taking various different plane sections of a right cone. where . Here, is the distance of closest approach to the origin. 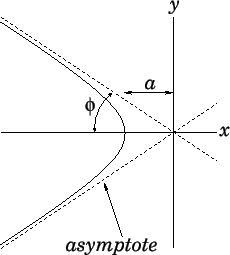 The asymptotes subtend an angle with the -axis. Equation (A.106) can be recognized as the equation of an ellipse whose center lies at ( , 0 ), and whose major and minor radii, and , are aligned along the - and -axes, respectively [see Equation (A.101)]. Note, incidentally, that an ellipse actually possesses two focii located on the major axis ( ) a distance on either side of the geometric center (i.e., at and ). 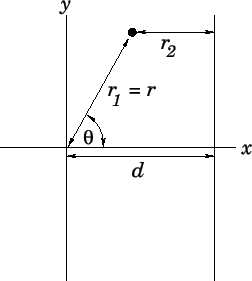 Likewise, an ellipse possesses two directrices located at . for . Here, . This is the equation of a parabola that passes through the point ( , 0 ), and which is aligned along the -direction [see Equation (A.102)]. Figure A.7: Conic sections in polar coordinates. with the -axis [see Equation (A.103)]. In conclusion, Equation (A.105) is the polar equation of a general conic section that is confocal with the origin (i.e., the origin lies at a focus). 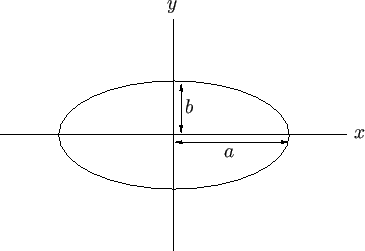 For , the conic section is an ellipse. 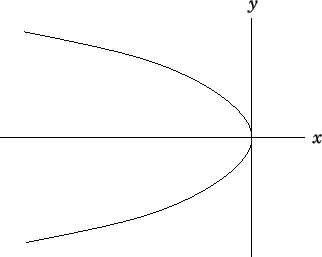 For , the conic section is a parabola. Finally, for , the conic section is a hyperbola.